Wed., July 11, 2018, 12:24 p.m.
A failure in the Warm Springs Lodge’s sprinkler system exacerbated fire, smoke and water damage to the building during a massive fire that broke out April 18, the Ketchum Fire Department concluded following an investigation. According to a report written by the department, the investigation traced the fire’s origin to four plastic garbage cans placed against a log wall, though investigators could not determine what ignited the fire. However, the report states that five sprinkler heads on an eave directly above the fire did not operate when the flames began to spread up the wall. A similar failure occurred in the lodge’s dry storage room. The sprinkler system did not operate and the fire in that room “burned very hot,” according to the investigation report. Using state public records laws, the Idaho Mountain Express requested a copy of the report from the city of Ketchum. The city released the report to the newspaper on Monday. The Sun Valley Resort did not respond by press deadline Tuesday to several questions seeking comment about the sprinkler’s system failure, if the system had been tested prior to the fire and if the resort plans to test or improve the fire sprinkler systems in its other properties. The fire began burning at the Warm Springs Lodge late at night on April 18 and continued into the morning of April 19. At its peak, more than 60 firefighters from agencies throughout the Wood River Valley were involved in battling the fire. The fight involved eight engines, two ladder trucks and a pumper. Damage to the building was mostly contained to its roof, and the resort announced in May that it could be repaired, and would not have to be rebuilt. The Idaho State Fire Marshal’s Office and the federal Bureau of Alcohol, Tobacco, Firearms and Explosives assisted the Ketchum Fire Department with the investigation into the fire. 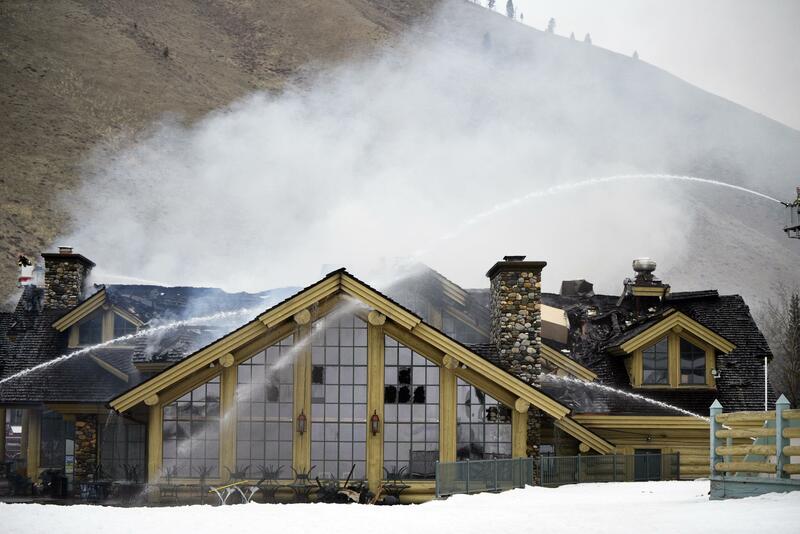 In the fire’s aftermath, the state and federal investigators interviewed all Sun Valley Resort employees who had been in the lodge the day prior to the fire. The interviews did not offer answers to the fire’s cause, according to the city report. The Ketchum Fire Department investigation then shifted to why the sprinkler system did not operate as it was intended to. The investigators traced the piping that fed into the eave fire sprinklers. The investigation also focused on the dry storage room. The investigators did not attempt to test the sprinklers’ operability in other parts of the lodge. The Fire Department reviewed records documenting the lodge’s fire sprinkler system to figure out why it was altered. The lodge opened in 1992. Investigators could not determine who was responsible for the modifications that exacerbated the fire damage. “It appears that the air compressor and the dry valve for the fire sprinkler system were removed at some point and that the exterior fire sprinklers under the eaves had been disconnected, which likely contributed to the spread of the fire in to the cold roof structure and severely damaged the building,” the report stated. The fire spread quickly once it reached the roof. In all, firefighters used about 2 million gallons of water to battle the blaze. They declared it under control about noon on April 19. The report includes a narrative of how the crews tried to fight the fire once they arrived on scene. Published: July 11, 2018, 12:24 p.m.